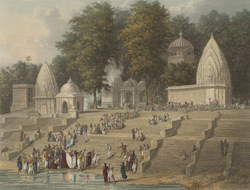 This is plate 13 from Robert Melville Grindlay's 'Scenery, Costumes and Architecture chiefly on the Western Side of India'. Grindlay (1786-1877) was only 17 when he arrived in India in 1803. He served with the Bombay Native Infantry from 1804 to 1820 and during this period made a large collection of sketches and drawings. In 1829, the British abolished the practice of 'sati': the burning of a wife seated on her husband's funeral pyre. Grindlay mentions a "fragment of ancient Sanscrit manuscript - presented by His Highness the Guikwar, the reigning Prince of Baroda, to the East India Company, [which] contains ... details of the ceremonies to be observed at the sacrifices, but no authority is believed to exist in the written laws of the Hindoos."